This eclipse was presented in the media as "the eclipse of the century!". Totality lasted for no less than 6 minutes and 38 seconds. This is fairly long for a total eclipse (just compare to the 1999 eclipse totality, which lasted for 2 minutes and 22 seconds). This century, not one solar eclipse will last longer. Unfortunately, this event was not at all visible in Belgium. The eclipse happened at Belgian night time. You had to go to India, China or the Great Ocean to observe it. 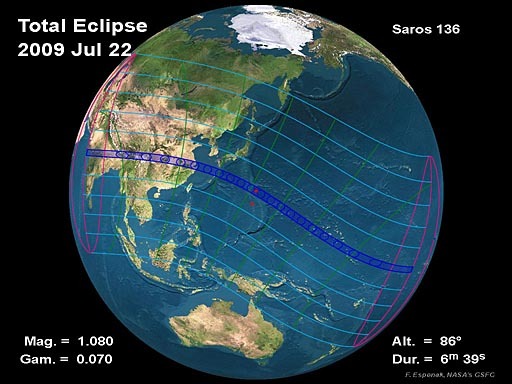 Some 300 Flemish enthousiasts left for China but only few actually got to see the eclipse. Even until the day before the eclipse, the weather was very good with temperatures of tropical dimensions (over 40° Celsius!). But the evening before the eclipse, clouds started to emerge. These clouds covered almost the entire area of totality. During totality, it even started raining in Shanghai. So a little bit of luck was really necessary. One could only hope for some sunny spells to be able to witness the totality of the eclipse.